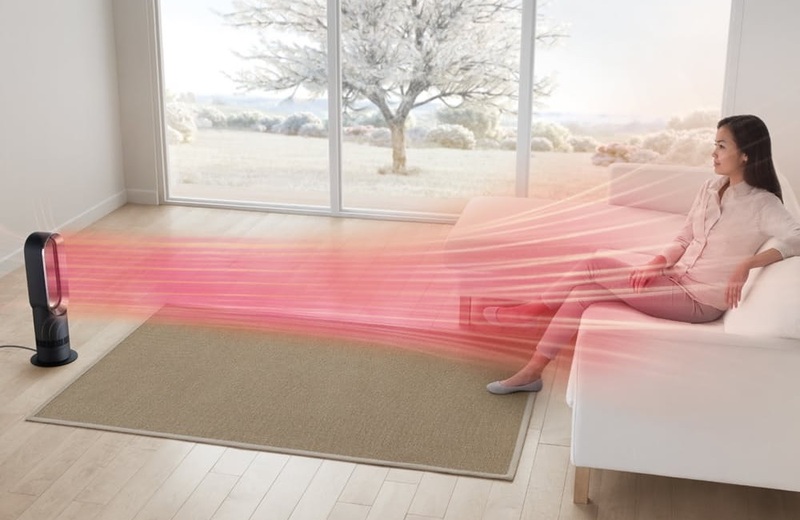 Heat up any room in your home efficiently. If you want to keep warm during these cold months without ending up with a hefty bill, then a portable fan heater is a great solution for small rooms. 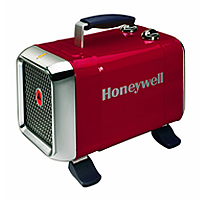 Because of its portable size, it can be easily transported to any section of your home to heat it up. Here are 5 of the best portable fan heaters for 2018 (read our summarized reviews here). Doesn’t have to be used just for the home, it’s also ideal to be taken on trips especially when it’s camping or in a caravan. Efficient heating – rooms heat up faster than other portable heaters such as oil filled radiators. Fan heaters usually take about 3 to 5 minutes depending on the room size. Size and weight – the small size and lighter weight makes it easier to carry from room to room, to take away on short national trips or for student accommodation. Some will have a carry handle too. Storage – it’s easier to store away anywhere since it doesn’t take up much storage space. 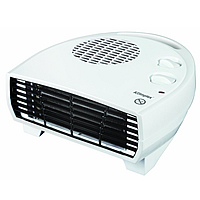 Pricing – the cost of buying a small fan heater is three times cheaper than other portable heaters. Running costs – as fan heaters heat up quicker and keeps the room warm for longer, it doesn’t need to stay on for long so it doesn’t use as much electricity to run. Oscillating function – the best portable fan heaters will have an oscillating feature so it can direct heat around the room instead of focusing the heat in one area. Versatile – some have a cool air setting so it can be used as a cooling fan in hotter months as well. 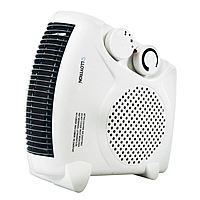 Not all portable fan heaters will have the same functions though they operate very similarly. Other features in a fan heater such as energy efficiency or cool air blow feature are also highly desired. You can read more about each of our top 5 models in our summarized portable fan heater reviews. 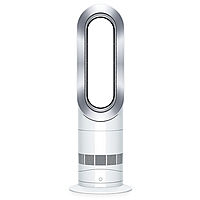 The Dyson AM09 is a popular but expensive portable fan heater that packs more tech than most other models. What is a Portable Fan Heater? 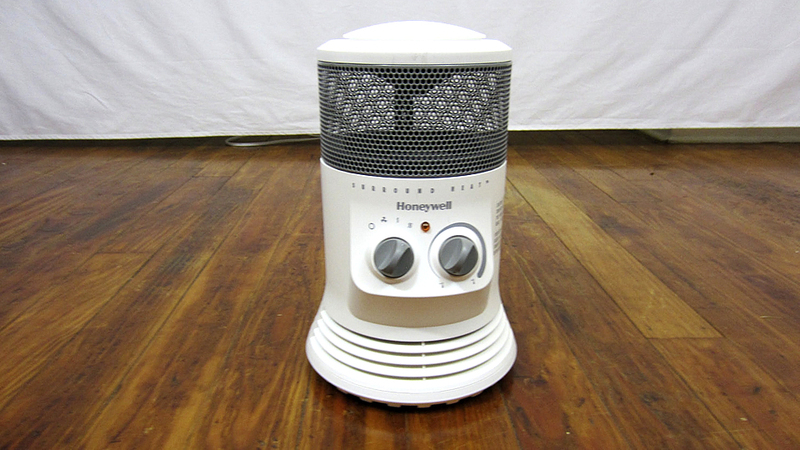 There are several types of portable heaters and each one works differently to each other. Some are powered by fuel or some other type of heating source. With a small electric fan heater, it works similarly to an electric fan but instead of blowing out cold air, it blows out hot air over a heating element within the device and heats up the surrounding air in the room. It also looks like an electric fan with the fan blades which are sealed within a casing with wide slits. However the gaps are more narrow slits in fan heaters. Small fan heaters will have the same whirring noise like electric fans so it can get pretty noisy but this is usually the case with cheaper fan heaters. However, some of the best portable fan heaters are so quiet that it’s barely noticeable and a few are fairly reasonably priced which portable fan heater reviews will tell you. 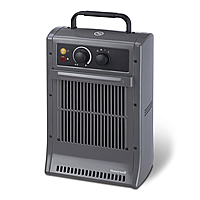 Portable heaters function differently to installed heating systems. What we can do with installed radiators such as hanging clothes there to dry cannot be done with a portable fan heater. The only thing they have in common with each other is that it heats up. No covering – it’s dangerous to hang things over a portable heater when it’s on in case the item gets pulled into the fan blades. Avoid using in wet conditions – you should keep the fan heater as far as possible away from where water could potentially splash or seep into the fan heater. Avoid using in humid conditions – there’s a risk of overheating which will lead to the heater short circuiting and cause a fire. Keep out of reach from small fingers – young children can potentially stick their fingers or small objects in between the gaps of the fan heater. Keep in an upright position – if the fan heater is knocked over and face down on the surface, place it back in its upright position immediately because it can overheat or damage the surface. Always follow the safety procedures – there should be instructions included on how to safely use your fan heater which you should read and follow before use. Some of the best portable fan heaters are pretty safe as it will have safety features installed such as a thermal fuse to disconnect the heating element within so it automatically shuts off when overheating occurs or if it’s tipped over. However, it doesn’t hurt to take extra precautions as one should with all electrical devices just in case the safety features fail.